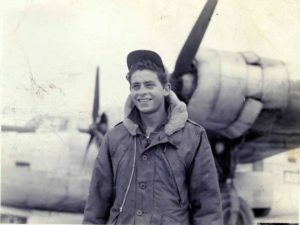 On December 23, 1944, a year after I left my home in Long Island City, N.Y., I landed overseas for active duty as a radio operator in the Air Force. It was my 20th birthday. After arriving in Naples, I continued my journey by train to Grottaglie, an air base a few miles from the port city of Taranto in Calabria. I arrived at the base apprehensive but also relieved the long voyage and months of training were over. I was assigned to the 716th Bomb Squadron, 449th Bomb Group, of the 15th Air Force. The others in my crew included Richard Gramsey, navigator; Max Thackston, engineer; Mitchell Gnaegy, our co-pilot; Al Richard, bombardier; Alvin Thornton; Orlie Baker; Ed Porter; and Peter Max. Captain Ed Rossi, a tough Brooklyn-born pilot who became a father figure to us, was our crew’s leader and old man. He was 22 years old. On January 15, 1945, I got my orders for my first mission (Mission 193). Our initial point (or main target): Floridorf Oil Refinery in Vienna, Austria. I had butterflies in my stomach when I found out where we’d be flying. We all knew Vienna was heavily defended by Nazi artillery. At exactly 1 PM, on a crisp, cloudless day, we arrived over the target. As we were about to release our bombs, deafening bursts of flak punctuated the sky in angry black puffs. The explosions surrounded our plane and seemed to get closer and louder. As I was leaning on my 50-caliber machine gun in the left waist anxiously watching this scary scene, a chunk of flak flew up from beneath my seat and right between my legs, whizzing past my head. I jumped away from my position and looked around the plane, which had been riddled with holes. Amazingly, none of us suffered even a scratch. My second mission, and then my third, passed relatively uneventfully. I remember thinking that we just ran into a little bad luck over Vienna and maybe that was the worst of what I’d see. Other crews flew dozens of times without suffering any serious damage, I thought. So why should it happen to us? On the morning of February 16, the day of our fourth mission (Mission 205), my luck changed. Our target was in Leipheim, Bavaria. I was nervous about having to fly over Germany and said a few Hail Marys in the waist for good luck as we flew. But we hit some bad weather and headed for our alternate target in Innsbruck, Austria, instead. It seemed like the entire 15th Air Force joined us—there were hundreds of planes all flying in a loose formation. And there was plenty of flak everywhere, worse than the first mission. It struck all over the fuselage, peppering it with holes. Then, as soon as we released our bombs, our No. 1 engine started to act up. Rossi decided to feather it (shut it down). It was late also in the afternoon, and the weather was closing in. We were also using a lot of fuel as we flew back over the Alps. It was obvious to Rossi that we didn’t have enough fuel to make it back to our home base. Rossi ordered me to get on the radio to find a landing field nearby. But my signals kept getting cut off. We were losing time. So I decided to send out an S.O.S. I was trying not to panic and was desperate to reach someone at Air Sea Rescue. Finally, I received one answer to my radio call, but it was too late. We were close to Pescara, a town on the Adriatic coast, when Rossi opened the bomb bay doors. “Everybody, bail out!” he shouted. Terrified, I quickly jumped out of the plane, right after Gramsey. As I tumbled awkwardly from the plane, the icy wind took my breath away. With the ground fast approaching, I collected my wits, opened my chute, and I floated down through the clouds over the Abruzzo countryside. The drone of our plane disappeared, and all was still and quiet. As I readied myself to land, I tried to avoid a copse of trees in a field. Instead, I crashed directly on top of one, snagged my chute lines in the branches, and ended up dangling several feet off the ground. Fortunately, a farm worker came running across the field toward me, shouting over and over in Italian as he ran, “O dio mio!” I called down to him in my best Queens, N.Y., to help free me. As I stood on his shoulders, he handed me a pocketknife to cut the cords of my chute. Thackston and Gramsey landed close by. But where were Rossi and Gnaegy and the rest of my crew? I felt sick and worried that they didn’t bail out in time. Soon, we attracted a small, curious crowd of local villagers. They were gesturing and talking excitedly as we handed out packs of Old Gold cigarettes to the men. An old woman brought us some homemade wine and bread, which we all devoured. I asked one of the men if he would direct us to the nearest town, which was a half-mile away. As we started on our way, a nervous-looking policeman intercepted us on the road and leveled his rifle at me. I told him we were Americans and showed him my dog tags. He seemed relieved and escorted us to the local police station, where he asked another policeman to bicycle to the British M.P. Station in the next town. While we waited in the police station for the British M.Ps, the little old lady we met in the field brought us a basket of fruit. And then, thank God, Rossi and Gnaegy and the others showed up. We were so happy to see them. Except for some minor scratches and bruises, none of us suffered any serious injuries. When the British arrived, we said our goodbyes to the local people and tried to give them money in exchange for their kindness, but as poor as they were, they refused to accept it. To get back to our air base, we had to hitch rides from the British and then a U.S. G.I. truck to the Air Force’s airbase in Foggia and wait for a plane. I knew that Foggia was close to San Marco in Lamis, a small town where my father was born. Shortly after leaving San Marco for Kansas City, M.O. with my mother, he died of pancreatitis, when I was just a few years old. While waiting in Foggia, I met a local man at the transient hotel where we stayed. He happened to speak English and told me he worked for the Air Force in town. I told him about my family and where we originated from. His eyes widened. Incredibly, not only was he from San Marco and knew my parents, he lived in Long Island City—my own small Queens neighborhood!—before the war and was friendly with many of my neighbors back home. He urged me to go with him to San Marco to meet my many relatives there, including an aunt and cousins. But I was scheduled to leave the next morning, and told him I would come back to visit soon. On my way back to base, I thought a lot about my father and my mother back home and the unbelievable chain of events that brought me so close to where they came from. I also thought how lucky I and my crew were to escape with our lives and the kindness of the people I met in Italy. In many ways because of my intense connection to the people there, I felt that I had found a new home. Several days after Frank Ciavarella got back to Grottalgie field, he received permission to visit San Marco in Lamis to meet his aunt, cousins and other relatives, and many friends and neighbors of his father’s family. He stayed in touch with them after he returned home from the war. In 1950, Frank married Mary Manta, and later had six children, eight grandchildren, and four great-grandchildren. Following his military service, Frank enjoyed a long career as a captain with the New York City Fire Department. He died at the age of 93 at his home in Long Island City, NY, in July 2018.